Series of talks "Nitsch meets..." with Prof. Karlheinz Essl as a guest. 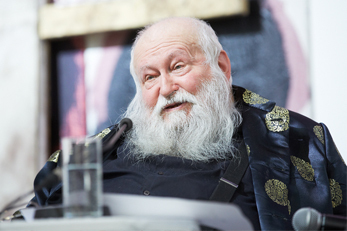 Under the title “Nitsch meets …”, every year Hermann Nitsch invites well-known personalities to his museum in Mistelbach for an exchange of ideas. In 2017 the series of events is being continued with the eminent entrepreneur and art collector Prof. Karlheinz Essl. With Hermann Nitsch and the host Michael Fleischhacker, the topics of art, religion, music and values in today’s society will be discussed.